Davis Downtown is a 32‐block Downtown Business Improvement District (DBID) formed in 1989. The DBID empowers business license holders in the defined area to self‐assess annual fees to ensure the economic well‐being of the DBID. Activities of the DBID include marketing, events, and advocacy. Advocating on behalf of the Downtown. Organizing, sustaining, and supporting activities and events. Expanding relations with the City and UC Davis. The annual report is prepared by Davis Downtown staff during September and October, reviewed/approved by the Davis Downtown Board of Directors, and submitted to the Davis City Council for consideration. 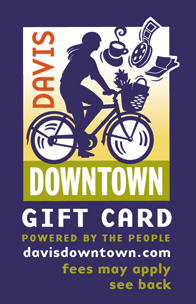 You can also download the Davis Downtown By-Laws here.